This EKG comes courtesy of Dr. Ross Hardy. 1. 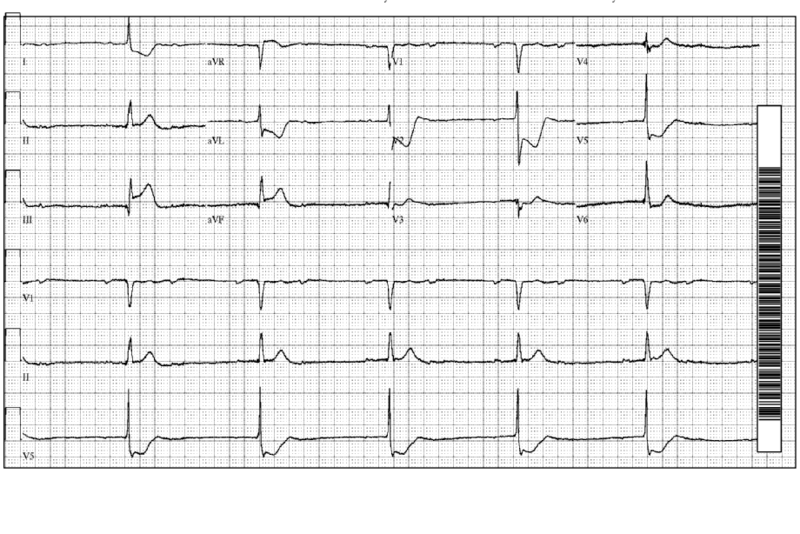 What findings does the EKG demonstrate? 2. What is the rhythm? 3. What is the appropriate management for this patient? The EKG demonstrates ST elevations in leads II, III and AVF with reciprocal depressions in V2-V6, I and aVL. This is consistent with an inferior wall (or inferoposterior) STEMI. The rhythm is sinus with a 2nd degree 2:1 AV block. The MI should initially be treated with antiplatelet drugs (aspirin, clopidogrel/prasugrel). The bradycardia with AV block should be treated with a pacemaker, as the patient is hypotensive. Initially, a transcutaneous pacer should be placed followed by a transvenous pacer. Once appropriate capture is obtained and the heart rate normalizes, the patient should go to the cath lab for emergent PCI. ST elevations are a sign of acute MI. When you identify both ST depressions and ST elevations on the same EKG, that represents an acute MI in the area of the ST elevations. The ST depressions in that case are only reciprocal changes. Leads II, III and aVF look at the inferior wall of the heart. Inferior wall MI’s can be associated with bradycardia and AV block. This EKG demonstrates bradycardia with dropped P waves. Some of the P waves are conducted through and some are not (best seen in lead V1). That is characteristic of 2nd degree AV block. Differentiating 2nd degree AV block from 3rd degree AV block can sometimes be difficult, as in this EKG. The following algorithm may be helpful. In this EKG, the RR intervals are regular and the PR intervals are regular. So, we are dealing with 2nd degree AV block. 2nd degree AV block comes in two types – type I (AKA Mobitz I, Wenckebach) and type II (AKA Mobitz II). In type I, the PR intervals progressively lengthen followed by a dropped P wave. Then the PR interval shortens again and the cycle repeats. In type II, all PR intervals are the same and there are some dropped P Waves. To differentiate 2nd degree type I from type II, you must see two consecutive beats where the sinus impulse conducts through. This allows you to determine if the PR interval is progressing (type I) or not (type II). In our EKG, every second sinus beat is dropped (best seen in lead V1). So, you do not see two consecutive sinus beats conducting through. This prevents you from differentiating 2nd degree type I from 2nd degree type II. This EKG pattern is referred to as a 2:1 AV block (every second beat is blocked by the AV node). In general, in 2:1 AV block, the presence of a prolonged PR interval makes type I block more likely, whereas the presence of wide QRS complexes makes type II block more likely. However, this is not entirely reliable. When faced with a 2:1 AV block, running a long rhythm strip may allow you to see two consecutive conducted beats. You can then measure consecutive PR intervals to see if they are prolonging (type I) or the same (type II).